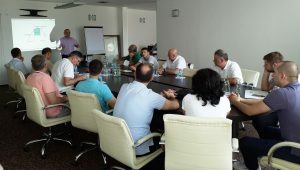 Within the project KRIN – Creation of a Regional Innovation Network, a two-day training for directors of enterprises and their associates on topic “Organization and operational management of the company ” was organized. Company directors and their associates had the opportunity to get acquainted with various modalities of management and organization of a company, challenges in transition of management from founders to professional managers, as well as topics related to transferring business to the next generation, business continuity, etc. The participants emphasized that this topic needs to be given greater attention in the coming period, as a prerequisite for more effective management and achievement of better results. The workshop was led by Mr. Boris Vukić from the renowned Adizes South East Europe organization, who is an expert in areas of family companies and companies moving from entrepreneurship to professional management. According to the feedback received, the company’s directors were very satisfied with the workshop held, which led many of them to thoughts about possibilities for improvement of management. Within the KRIN project – creation of a regional innovation network, the last of the four planned trainings will be organized in September, on the topic of innovation of business models.